Winter ailments is an umbrella term for all the winter season related diseases like colds, congestions, coughs, flu, skin allergies due to cold, fevers, sore throats, strep throats, sinusitis and other infections and allergies. Most of these ailments are the result of a weak and unbalanced immune system of the body that cannot put up a good fight against these ailments. People tend to pop antibiotics pills to get instant relief from these ailments but these pills provide temporary relief. Moreover, antibiotics tend to lower the immunity and have side effects. So, it is advisable to explore and adopt natural home remedies for the treatment of winter ailments. The reduced winter temperatures and lack of sunlight provide an ideal environment for the growth and spread of viruses and bacteria which cause the common cold, sore throat, cough, flu and other related diseases during the winter season. The dry cold weather can make the skin dry, flaky and itchy. This dry skin cracks and chaps further to form sores. Avocado oil, jojoba oil, coconut oil and other such natural oils, because of their soothing properties, are effective as well as natural home remedies for winter ailments of this kind. Winter season tends to aggravate the symptoms of rheumatoid arthritis and circulatory disorders. Extreme cold can lower the body temperature below the normal level and impair body functions leading to hypothermia. 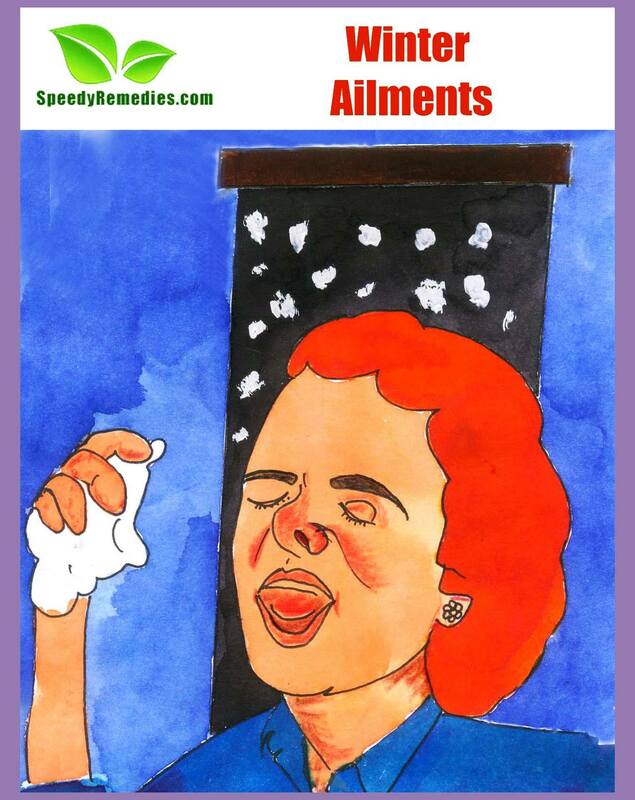 People often confuse between winter ailments like influenza and common cold because of their similar symptoms. But, one should keep in mind that influenza is more serious as compared to common cold. Influenza is characterized by a raised temperature, alternating with the chills. The patient tends to feel lethargic and is likely to have aches and pains in various parts of the body. On the other hand, the common cold is characterized by runny nose, sneezing, itchy eyes, fever, tiredness and loss of appetite. Common cold may last for four to fourteen days in general. Moving to another winter ailment, that is flu; it is characterized by a high temperature of the body, weakness, shivering and feverishness, nausea, headache, and aching muscles. Flu usually comes on more suddenly than a cold. It generally lasts for seven to ten days. Cold sores can be described as small red patches on skin. They are usually accompanied by a tingling sensation that further develops into a blister. Another common winter ailment is a Chilblain. Chilblains are swellings on the fingers and toes. They tend to become infected if the skin breaks down. It takes about seven to ten days for chilblains to heal. • Drinking lemon balm twice a day is one of the simplest and equally effective natural home remedies for flu. • An all juice diet for four days along with Acerola cherry, Rose hips or other such herbs that are rich in vitamin C helps prevent as well as cure winter ailments by building immunity in the body. • Take two teaspoons of ginger juice, one teaspoon of honey and a pinch of turmeric. Add these ingredients and take this mixture 2-3 times a day. This is one of the most popular natural home remedies for winter ailments, especially coughs. • Applying hot vinegar or sandalwood paste on aching muscles and joints can provide an immense amount of relief. • Place two drops of either peppermint or eucalyptus oil on a cotton ball and hold it near the nose. This home remedy is helpful in clearing blocked sinuses. • Simmer half teaspoon of Echinacea root and an equal amount of marshmallow in two cups of water. Remove from heat and add half a teaspoon of peppermint leaves, one teaspoon of chamomile flowers, and one-fourth teaspoon of ginger rhizome to it. Allow this concoction to steep for 15 minutes. Then, strain it to retain the essence. Drinking one or two cups of this herbal tea is an effective home remedy for healing skin allergies. • Another such herbal tea can be prepared by a combination of chopped ginger, garlic, shoyu, lemon, and cayenne steeped in hot water. • Extract the juices of herbs like holy basil, cassia, and henna and apply on skin allergies due to winters. • Cayenne pepper, Fish Oil, Ginkoba Biloba, Rose Hips, Evening Primrose Oil, and Acerola Cherry can be taken orally to help boost the circulatory system. • Prepare a mixture by adding two teaspoons of honey and two teaspoons of apple cider vinegar in hot water. Taking this mixture every morning is an effective therapy used in coping up with increased arthritic pains in winters. • Crush poppy seeds and add lime juice and water in equal proportions to form a paste. Skin allergies can be cured completely by applying this paste. • Few drops of oregano oil are useful in reducing sniffles and sneezes. • Sage leaves provide relief from influenza related inflammations of the mucous membrane. • Drinking a mixture of honey and half cup of grape juice treats cough effectively. • Peppermint tea and thyme also have therapeutic properties. • Onion is helpful in clearing clogged arteries. Mix honey with onion juice and drink it to get rid of cough and chest congestion. • Take a pinch of turmeric powder in a glass of warm milk. Add three-fourth teaspoon of honey and one-eighth teaspoon of white or black pepper to it. Drink this warm mixture before bedtime and in the mornings; aids in healing the inflammations inside the throat and stomach. As most of the winter ailments are caused due to poor immune system, the diet for winter ailments should be aimed at achieving a good and healthy immunity against such ailments. Consumption of milk and other dairy products should be encouraged as they have good bacteria which build immunity. Taking plenty of rest and exposing the body to adequate sunlight also improves immunity. Vitamins, minerals and antioxidants are helpful in fighting winter ailments. Ascorbic acid present in Vitamin C helps prevent common cold and flu by fighting germs. Green leafy vegetables, berries, oranges, kiwis, guavas, tomatoes, lemons, melons etc have abundant amounts of vitamin C in them. Warm foods such as soups, stews, dried fruits and fruits like papaya, pomegranate and apples are highly beneficial. Tomato soup, spinach soup, vegetable soup and other such soups should be consumed more in winter season. Raw fruits and vegetables contain anti oxidants that protect the cells. Chewing 2-3 fresh garlic cloves every day is a highly recommended natural home remedy for winter ailments. We tend to drink less water in winters. This causes dehydration which in turn causes dry lips, nose and mouth. Apple juice and dark grape juice are also conducive provided they are consumed at room temperature.